Hello, and welcome to McLaren North Jersey; your location for the best McLaren service and assistance in the Ramsey region. Whether you are in need of a significant repair or just a scheduled tune-up, you can have faith the McLaren North Jersey team of devoted McLaren accredited mechanics is here to steer you through every phase of this process. For those drivers in Ramsey who have a vehicle not of the McLaren model family, the McLaren North Jersey team would be more than delighted to offer up our services to you during this important process. Our automotive service experts have years of experience working with repairs and support for virtually every manufacturer, so you can always feel comfortable knowing your non-McLaren automobile is in good hands when the time comes to drop it off for a repair. Before you make your ultimate decision regarding your repair concerns, please join us in learning exactly why McLaren North Jersey stands as the most trustworthy and reliable purveyor of automotive service in the Ramsey region. After doing this, chances are that you will want to set things in motion regarding your service needs and plan out a trip to McLaren North Jersey in the near future. Why Should I Book My Service at McLaren North Jersey? A Commitment to Quality and Safety – The McLaren North Jersey staff takes your wellbeing seriously, so you can take to the streets of Ramsey with confidence knowing that we will do whatever is necessary to get your car back in working order in as quick a manner as possible. Affordability Is Always in Fashion at McLaren North Jersey – Not looking to pay an arm and a leg for your car service? Then pay a visit to McLaren North Jersey, and you will soon see just how important it is to us to keep you on budget. Access to Premium Replacement Parts – Servicing a McLaren car? Then you will be happy to hear we have access to any high-quality original equipment manufacturer (OEM) part needed to take care of your distinct service problem. The moral of the story here? McLaren North Jersey is the best option in the New York region for customers who want to take advantage of the optimal blend of excellent service, premium support, and reasonably priced repair rates. 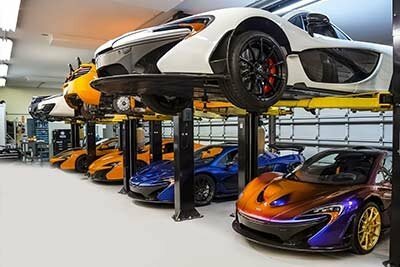 Digging a little deeper, McLaren North Jersey is not just the dealership that offers up the optimum mix of reliability and affordability, but also home to the most proficient assortment of McLaren certified technicians. While you might be questioning the notion of always needing to turn to the top workforce of McLaren technicians here in Ramsey, the reality of the situation is these pros have competencies and training that effortlessly supersede what you will find at any of our nearby competitors. Yes, it is not unheard of for these smaller service providers to utilize clever or enticing sales practices and showmanship in an attempt to woo unsuspecting consumers. However, it is still vital to understand that only licensed McLaren professionals have invested the countless hours necessary to receive this honored designation from McLaren. At the same time, claiming this distinction also comes with the power to engage directly with McLaren and stay abreast with all of the latest news and insight into McLaren cars and proper repair and support methods. When it comes to making sure your automobile is capable of taking to the road without risk and reliably, are you genuinely ready to settle for anything but the top-quality support and heightened standards that come with work completed by a certified McLaren mechanic? Oil Changes – Failing to consistently change your oil is a fast way to wear down the integral parts of your motor via a lack of lubrication. Tire Rotations – Wearing, splitting, and bald spots, in addition to a greater risk of mishaps, are all symptoms of tires that have not been rotated on a regular basis. Timing Belt Changes – A neglected timing belt is much like an impending disaster in that it can cause severe damage to a car's engine if it reaches the level of major wear and fails during your time spent behind the wheel. Brake Inspections – Even though most discussions related to your brakes might feel boring or mundane, taking a minute to inspect these critical components on a frequent basis ensures they are ready to work correctly when you need to slow things down. The message here? Bypassing the regular upkeep your vehicle desperately requires to stay in top condition is never a strong choice. The sustainability of your automobile (and your finances) is at stake, so feel free to connect with McLaren North Jersey when you are ready to handle these straightforward services. Now that you are up to speed with the need to come to a respected service provider like McLaren North Jersey for your service and maintenance concerns, there is no better time to work with our certified team and set up a suitable service itinerary. To get off on the best foot with this undertaking, make it a point to give our team of dedicated and McLaren-trained auto professionals a call at 201.639.7750 today. By choosing to bring your valued business to the service staff found here at McLaren North Jersey, you can ensure you always get the longest useful life out of your favorite car, truck, or sport utility vehicle (SUV). Considering how important keeping your vehicle in peak condition is to your day-to-day routine, and your time devoted to traveling outside Ramsey, it makes plenty of sense to get with the McLaren North Jersey crew immediately and get back on track with your routine service plan as soon as possible.